Attention to performance metrics can enhance business value, so you might try using a few new financial ratios in your spreadsheets. For those of you involved with firm financial management, you expect to regularly review the balance sheet and income statement and maybe a cash flow statement. While these documents provide vital information necessary to make good business decisions, I should tell you that they may not go far enough. In the business of valuing privately-held A/E/P and environmental consulting firms, we analyze these statements for the story they tell. However, it’s only part of the story. We also conduct an in-depth ratio analysis for a deeper look into the financial drivers of the firm. As a principal, you should be doing the same on a regular basis to gain a better understanding of how just a few internal operational tweaks can lead to vastly improved performance and increased share value. Current ratio (current assets/current liabilities). The current ratio measures the ability of the firm to meet its short-term obligations. The greater the current ratio, the more solid financial position the firm has in terms of its liquidity. A ratio of 2.0 means that a firm has twice as many assets convertible to cash as it does liabilities. The 2017 median current ratio from Zweig Group’s survey is 2.13. Quick ratio ((current assets – work in process)/current liabilities). This is another look at liquidity, although from a more immediate point of view by removing work in process. The 2017 median quick ratio from Zweig Group’s survey is 1.92. Chargeability ((direct labor hours/total labor hours) x 100). Chargeability is a measure of the percentage of total raw staff labor hours charged to projects, calculating the firm’s labor expenses that are billable. This is a good measure of efficiency and effectiveness. Zweig Group’s 2017 survey median ratio is 60.7 percent. Break-even multiplier ((total payroll + total G&A overhead/direct labor) x 100). This multiplier calculates the amount a firm must generate per dollar of direct labor to cover its overhead costs and direct labor. The 2017 median multiplier from Zweig Group’s survey is 2.54. Break-even analysis (total fixed costs/gross margin). This is a simple way to understand the minimum level of sales needed just to make it to zero net income at the end of a year. For example, if your annual fixed costs are $1 million and gross margin is 75 percent, your firm will need to achieve total revenue of approximately $1.33 million. This is one of my favorite planning tools; it’s simple, yet powerful. Average collection period (accounts receivable/(gross revenue/365 days)). This ratio measures the efficiency of accounts receivable collection. The 2017 median ratio from Zweig Group’s survey is 76 days. These ratios are but a few that can be calculated from your existing financial statements. In fact, there are a little more than 30 indicators included in the 2017 survey. Firm owners need every tool possible to win. If you’re not already doing so, I encourage you to present some new material at the next board meeting. It’s as close as your Excel spreadsheet. Tracey Eaves, MBA, CBA, CVA, BCA, CMEA is a member of the valuation consulting team at Zweig Group. Contact Tracey at teaves@zweiggroup.com or directly at 505.2588821. Want to save $320? 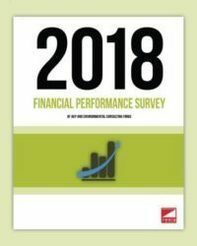 Participate in the 2018 Financial Performance Survey and get a discount code, good for $320 off any Zweig Group Survey. Participation closes 3/31/18!